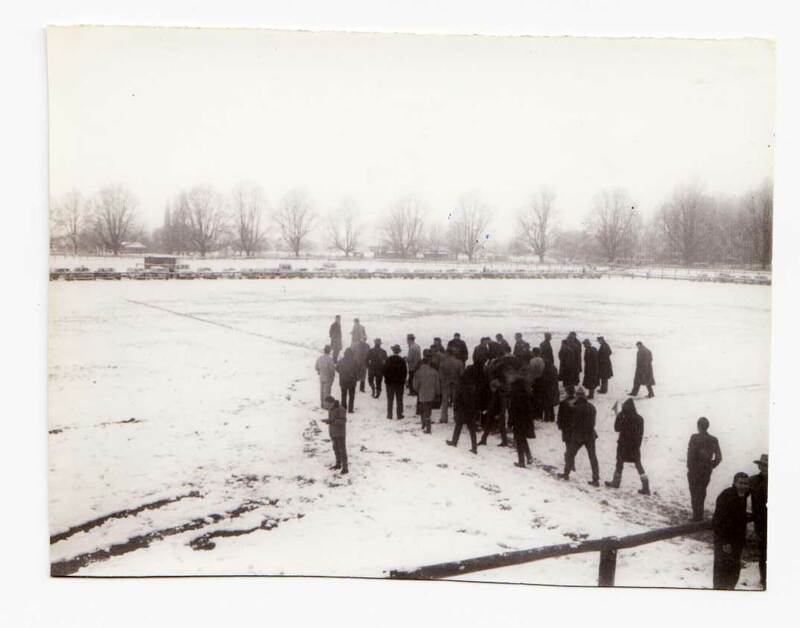 After some forty-five years, interest in the Maher Cup was beginning to wane by 1965, but at Tumut on the 7th of August a deep covering of snow didn’t deter some 500 diehards from driving out to the Racecourse ground for another gruelling encounter. Grenfell, as Group 9’s most underperforming team may have lacked talent but made up for it in enthusiasm. 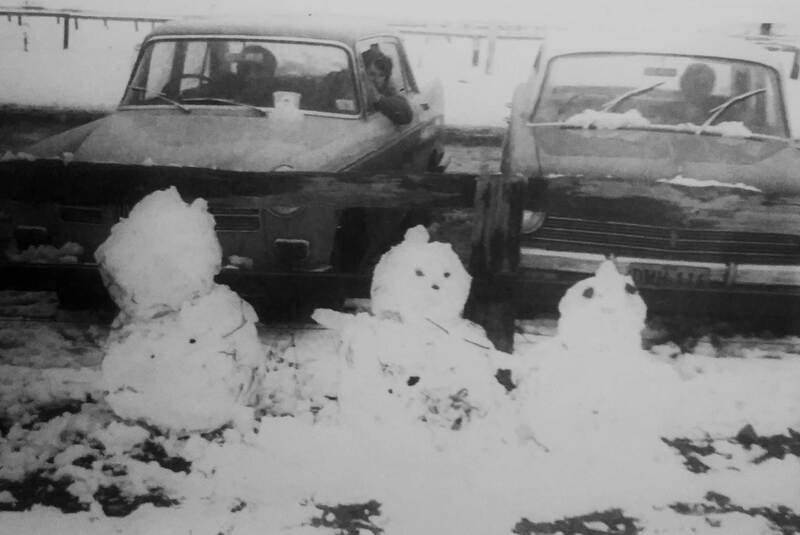 While the local snow may have been to the Tumutites simply humdrum and inhospitable, for the Weddin lads from a warmer winter it was a novelty. Barry Beiber’s boys had come 130 miles – and with only one of the four roads into Tumut open – they came through somewhat difficult conditions. Not even a bribe of £35 from reluctant Tumut officials could entice them to get back on the road without doing the business. It’s unlikely they would have backed themselves though, having lost their last six challenges by an average of 26 points, and being declared by their local newspaper as “rank outsiders”. However punters know that upsets often occur in unusual conditions. The Tumut Times reported that following a disagreement between the two captains regarding the state of the ground, the decision of the referee (and ex-local player) Ken Green to play “was received ungraciously by many players from both teams and also spectators”. 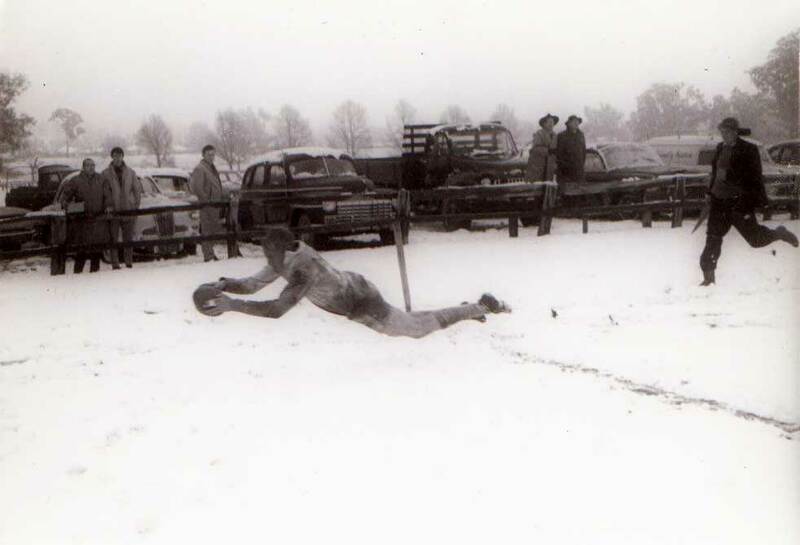 Once the committeemen had hacked and raked the snow away from the lines, and while the kids built snowmen on the sidelines and chucked icy balls at all and sundry, the game got going. 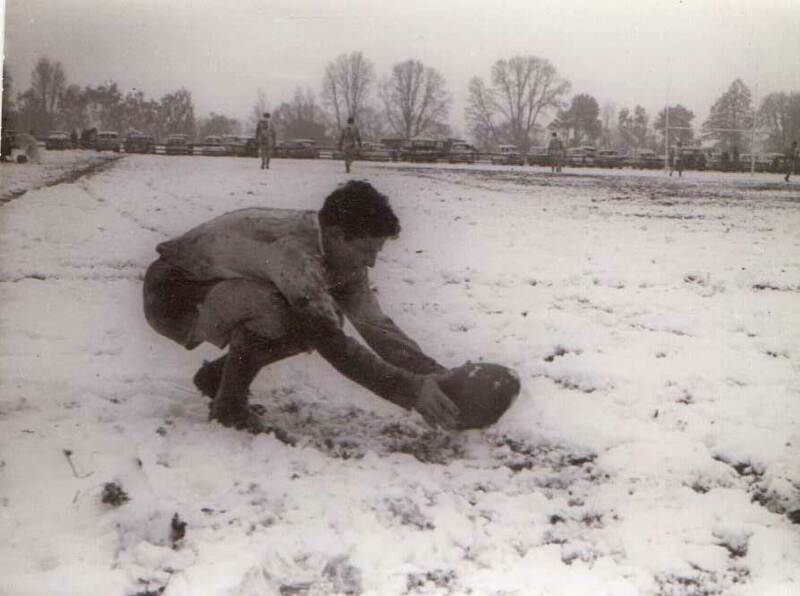 The Tumut team quickly warmed to the conditions and “skimmed over the snow with full control of direction, displaying footwork and combination rarely seem on a dry and firm ground”. Their frantic pace was as much about not freezing as much as winning. Grenfell’s tactics were to keep the ball tight in the forwards. Luckily it failed and no-one froze to death. The Tumut spectators were soothed by what they saw – a very talented team scoring three gems of tries before half-time. At the break there were no oranges. With snow still falling, the “most popular people at the ground” were the Tumut ladies with their hot soup stall. It was all becoming muddy and slippery with the ground churned up. According to the Grenfell Record: “When players regained their feet after being tackled the water on their jumpers and shorts immediately turned to ice”. 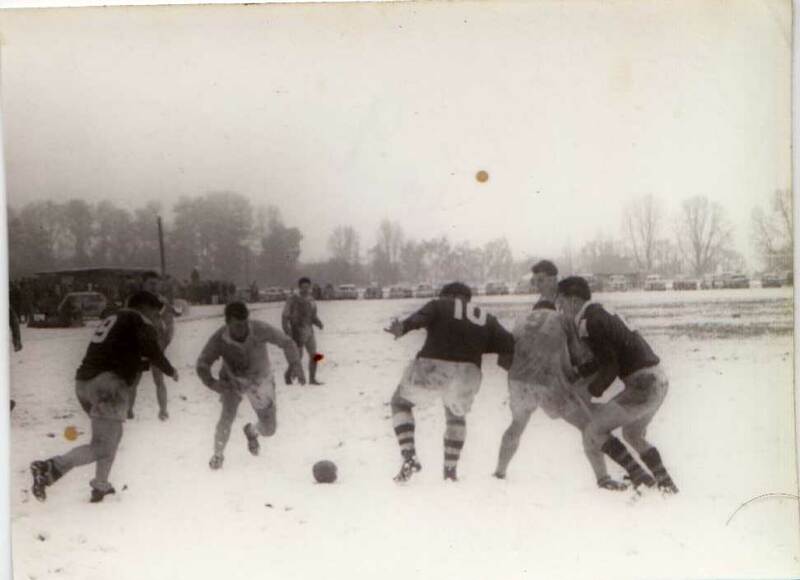 After Tumut scored their fifth try with eleven minutes still on the clock, with light fading and players drowning in slush, common sense suddenly took hold and everyone went for more warm soup and a welcome hot shower. Coincidentally Grenfell and Tumut were scheduled to meet in their Group matches at Grenfell the following day. 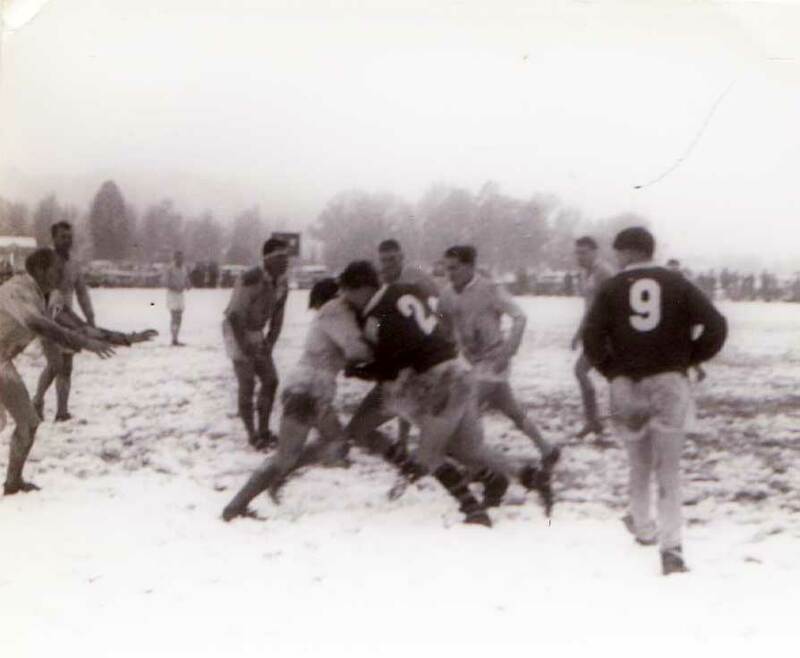 Tumut tried to tempt the visitors to stay over in front of a cosy fire at a local hotellery and play the match at Tumut – but whether it was due to their dread of more snow or loyalty to their own fans – Grenfell went home that cold Saturday night – only to lose 33-8 the next day and clinch the wooden spoon. Mick Redden, Geoff Brain, Peter Jeffery, Ken Eggleton, Barry Madigan, Doug Crampton, Gary Jeffery, Barry Webb, Robbie Symons, Bruce Kingsman, Kevin Purcell, Allan Wingate, Ray Bryan. For Robbie Symons and Kevin Purcell it was their Maher Cup baptism. Keith Bradtke (came off injured – John Franklin went to fullback and Wally Gam to 5/8), John Pearson, Peter Hodge, Noel Stonham, Ron Porter, John Franklin, Bob Bradtke, Les Scott, Barry Beiber, John O’Loughlin, Ken Fitzgerald, Geoff Gravenmaker, Col Hardy. Warming to the Task…Geoff Brain dives over. Tumut’s tries were all scored by the backs and halves: Geoff Brain(2), Doug Crampton, Gary Jeffery, Mick Redden. Grenfell were scoreless but a kick by Keith Bradtke at least encouraged one touch judge to raise his flag. This entry was posted in Matches and tagged Grenfell, Snow, Tumut. Bookmark the permalink.